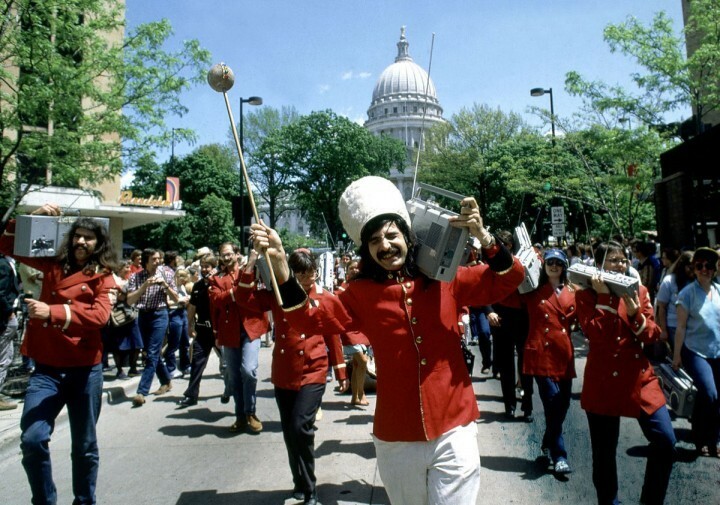 Leon Varjian, the Merry Prankster, the King of Whimsy, leading a boombox parade down State Street on June 2, 1980. Leon worked with his cohorts to tune all boomboxes to WORT, having synchronized with the station so that marching music played during the entire parade; perhaps the only extended marching musical interlude ever to play on WORT. Leon Varjian passed away in his home in Wood-Ridge, New Jersey, on Monday, September 28th, of an apparent heart condition at the age of 64. But Madison will always remember Leon as the best of the Madison personality, a man who pushed whimsy to the extreme, used satire to comment on the limited nature of student government, and made us all gasp in awe at his “happenings” (1000 pink flamingos on Bascom Hill! 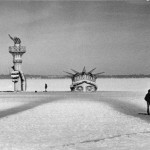 Statue of Liberty in Lake Mendota! 30,000 person toga party!). It was like winning the Golden Ticket to Willy Wonka’s Chocolate Factory, but we were all invited. Listen to Leon’s interview on WORT’s A Public Affair, back in 1988. Wherever Leon’s spirit might have wandered, we know he’s leading a parade of some kind. Thank you for the memories, Leon. The town hasn’t been quite the same since you left. Every town has something unique, something that makes residents say, that is us. For Madison, it’s Leon Varjian and his pranks. The Memorial Terrace. The Henry Vilas Zoo. The Dane County Farmer’s Market. And for many, that list would also include WORT, the distinctive heartbeat of Madison and Dane County since 1975. That heartbeat quickens this Sunday, at 8 AM, as we start our fall pledge drive with the lovely music and hosts of Musica Antiqua and ends Sunday night, October 24th. Our theme for this pledge drive? 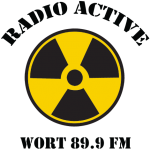 WORT & WORT Supporters: Radio Active for 40 years. 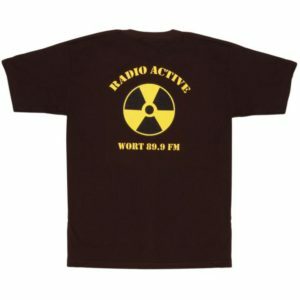 Yep, 40 years ago WORT was birthed from an impractical, impossible concept: that part of the airwaves belonged to the community. Since then, thousands of volunteers and tens of thousands of donors have actively worked to create a station as eclectic, as controversial, as infuriating, and as perfect a representation of our community as it could be: WORT. Yes, a rich brown with the old radioactive symbol on the front (that bears a more-than-passing resemblance to a reel from our old reel to reel tape decks) and a little more info on the back. A pledge of a mere $89.90 gets you clothed in a radioactive haze. Quantities are limited (really, our volunteers have already pledged for 15% of our stock! ), so get your donation in early. We also have a new NOAA AM FM Weather Radio that is powered by a solar panel, or hand crank. It’s a combo sturdy radio, water resistant LED flashlight and cell phone charger, all in a compact model the size of your hand. Leave it on your window sill to charge and it’s ready to go camping, to a football game, or down in the basement with you during the next tornado warning. Owen Gromme’s Birds of Wisconsin is also back as a thank you gift (if you have one, you know what a great gift it would make) as well as many new thank you gifts. 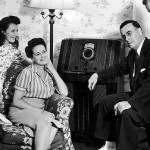 But we know it’s the incredible knowledge and great taste of our volunteer music hosts, backed up by the intrepid reporting of news volunteers from across our community that is the real thank you gift for pledging. In fact, well over half of you don’t select a thank you gift of any kind! Join us this Sunday and the next two weeks as we celebrate the spirit of Leon Varjian during our pledge drive. It’s a party! Wear your toga!